My complete unit on teaching beginning sounds - or first sounds - is here! This is the pack I use at the beginning of the year in kindergarten. This is Unit 1 in my kindergarten phonics program. I am excited to share this curriculum with you! I posted FREEBIES for you to try with your students too. Like many of my units, I keep this pack in a flexible 3-ring folder with page protectors. I like being able to see all of the activities - no more digging through file cabinets! CCSS.ELA-LITERACY.RF.K.2.E Add or substitute individual sounds (phonemes) in simple, one-syllable words to make new words. CCSS.ELA-LITERACY.RF.K.3.A Demonstrate basic knowledge of one-to-one letter-sound correspondences by producing the primary sound or many of the most frequent sounds for each consonant. This unit comes with both pre and post assessments. I administer the tests 1:1 and give students a laminated color copy. I record their answers on the BW copy. The test covers both phonological awareness (letters and sounds) and phonemic awareness (just sounds associated with pictures/words - no letters.) Please note: the test does NOT cover substituting initial sounds, but you can add this orally. Your kiddos will have so much fun learning and mastering first sounds with this unit! I start the year with a lot of phonemic awareness and whole group activities. Kids love it when you use their names, so this is a natural place to start. For example, I might start with a name game. "Brayden, Brayden /b/ /b/ /b/ Brayden starts with /b/"
Who else has a name that starts with the /b/ sound? "Bailey, Bailey /b/ /b/ /b/ Bailey starts with /b/"
Then you can pull out these alphabet and picture cards to use in a pocket chart. I detail a few whole group games we like to play with these cards. Depending on the reading program your district may require you to follow, there are so many different "orders" to teach letter sounds. We generally start with letters such as /s/ /p/ /m/ /d/ because they have such distinct, easier sounds for kiddos to pick up on. Once they know two letters/sounds, we do the first sound sorting pages. I love these because they only have to differentiate between TWO sounds/letters at once. I model the activity the first time for them, and after this they catch on super quick and really enjoy completing these pages. These pages also fit nicely with any reading program as you can use them in any order you wish. Once my kiddos know a few sounds, I also start using the Draw My First Sound activity pages. On these worksheets, they trace the letters and then I give them one picture/example. This activates their schema so they aren't totally grasping at straws. They then have to generate an answer on their own and draw a picture of something that starts with the same first sound. I also like using the matching first sound pages. This only addresses phonemic awareness as they are not using letters - only sounds. You can start with these pages or use them as intermittent review. 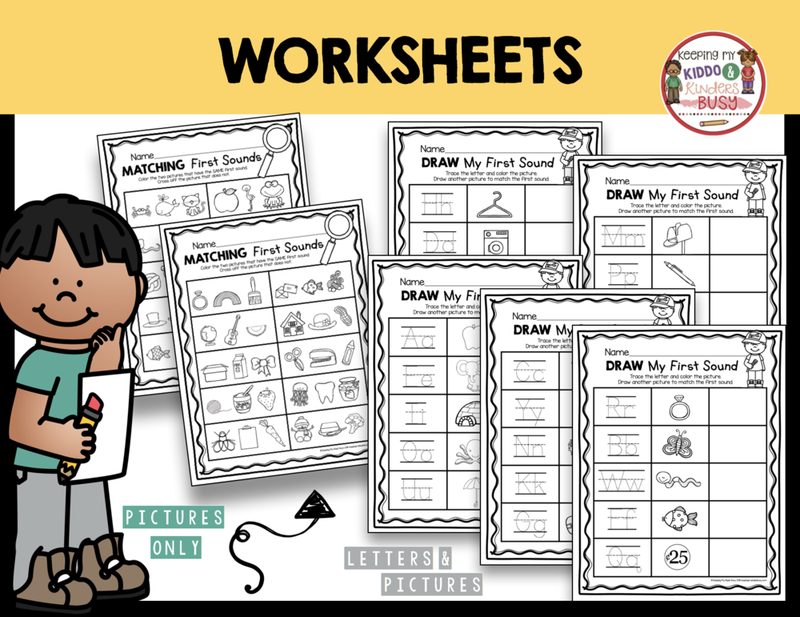 Whether you're reviewing or introducing sounds, these worksheets help you target your instruction by only focusing on four letters/sounds on each page. Once my kiddos have been introduced to some of the sounds using the picture/letter sorts, I start incorporating these pages into my instruction. Again, it may depend on the program you're using but both of the worksheets above focus on the same sounds. For example, I start with the p,m,s,l page after I have taught those four sounds. I start with the First Sound Bubbles page since they don't have to write the letter. I like giving them "multiple choice" to build confidence to start. This targeted approach, and constant review really helps to build student's confidence and mastery of first sounds. This worksheet is a FREEBIE! It is available for you to print at the end of this post. I made another activity that follows this same sequence of letters, and we use it in our literacy centers. See below! 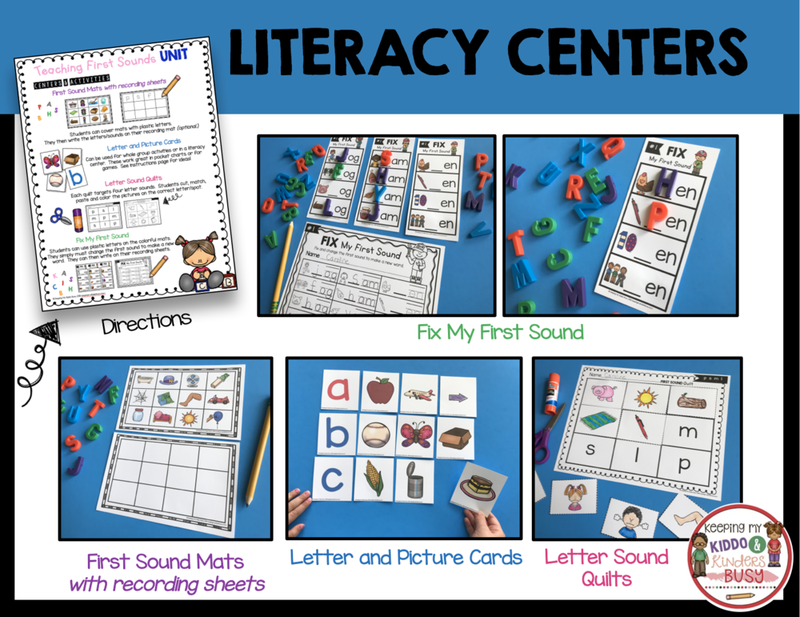 Literacy centers can be tricky to use at the beginning of the year in kindergarten, but with lots of modeling, reviewing expectations and monitoring you can definitely be successful with these! We absolutely LOVE using the First Sound Quilts. As I was sharing above, I like to target my instruction and focus my daily/weekly activities on specific sounds. These "quilts" coordinate with the activities I explained earlier in the post. This is our p,s,m,l quilt. The letter sounds/sequence match the Fill in the Bubble and Missing First Sound pages. This quilt is a FREEBIE! You can grab it at the end of this post. The organization and planning are done for you! These quilts are similar to to my CVC quilts and my kiddos love them! We do the first one whole group and I model my expectations, but they catch on really quick and it can be moved to a weekly literacy center. Students color, cut out and paste the pictures on to the correct first sound/letter. Students can't really "copy" each other because each quilt only focuses on four letters/sounds, so their quilts can turn out slightly different from each other this way.Four different versions of these First Sound Mats are included. Students simply place the correct letter on each picture.I like to use a recording sheet for extra practice and accountability, but it is not necessary. The possibilities are endless with these Letter/Sound Picture Cards. My kiddos LOVE the Fix My First Sound literacy center. This is a fun way to help students learn how to substitute initial first sounds to make new words. It builds confidence quickly and helps your kiddos see the patterns with words. It is also great rhyming review! I like to use the included recording sheet, but this is up to you. The recording sheet can also be used as a separate activity too! Check out this video to see the unit in action! Here are a few fun FREEBIES you can try out with your students! 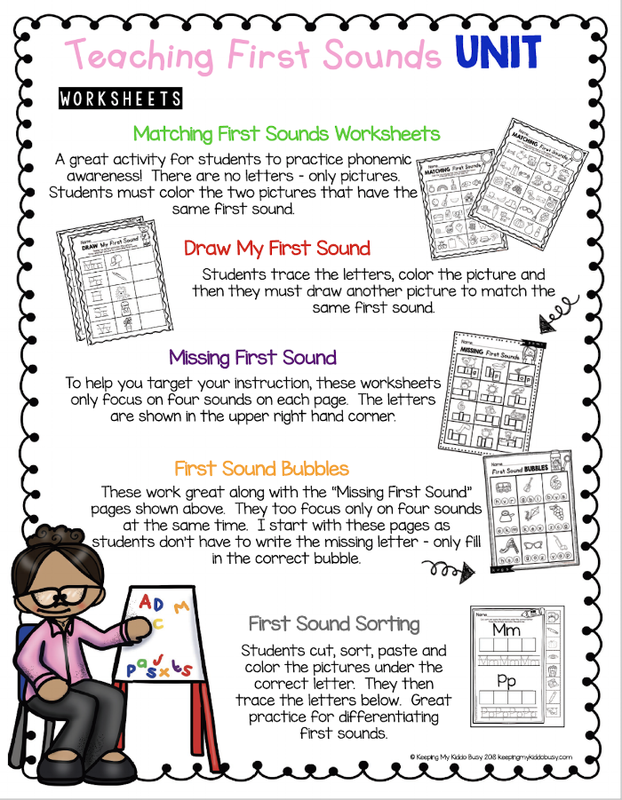 Ready to get started with this First Sounds Unit? Try FREEBIES and see each unit in action! Or SAVE BIG with the BUNDLE!